We no longer carry the 2005-10 Mustang Livewires Spark Plug Wire Set Black 4.0. Check out 2005-2009 Mustang Ignition for an updated selection. Swap out those old wires on your 2005-2010 Mustang V6 with these easy to install spark plug wires! 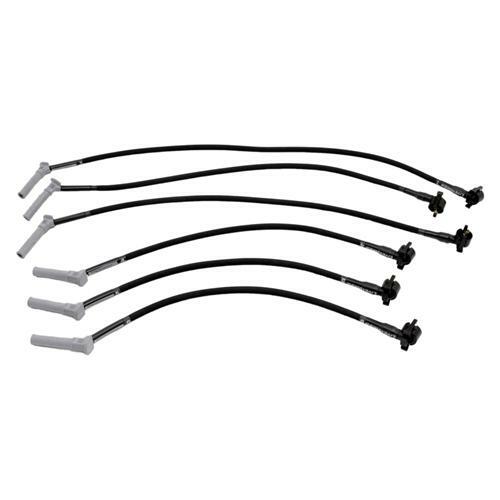 Replace those dry rotted and cracked spark plug wires with this Black Livewire set for your 05-10 Mustang. They are made with space age, heat resistant sleeving. This provides protection from -76° to +1400° F and offers excellent resistance to moisture and chemicals. With the custom fit, no assembly is required. Simply pull them out of the box and swap the old ones out. The heat shrink applied between the boot and the sleeving keeps dirt and moisture away from wire terminals. Swivel boots are easy to work with. Livewires spiral wound core prevents electronic interference. They offer extremely low resistance of 300 - 350 Ohms per foot for optimum spark travel. No radio noise or computer interference and they work with delay boxes and stutter boxes. This spark plug wire set comes with a packet of Dielectric Grease. Dielectric grease is electrically insulating and does not break down when high voltage is applied. It is often applied to electrical connectors, particularly those containing rubber gaskets, as a means of lubricating and sealing rubber portions of the connector without arcing.